Well, we’re back. In fact we’ve been back in the UK for ages now. 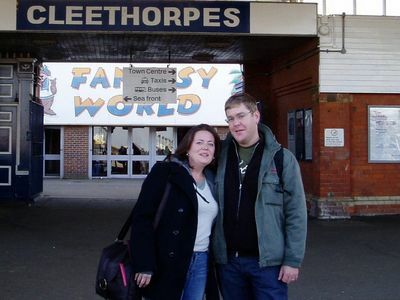 We had a week and a bit in Cleethorpes with my parents (including a visit to see Grimsby Town beat Chester). While in Cleethorpes we also bought a car, 1999 Volvo S40 1.6 XS which has been behaving itself since. After Cleethorpes we spent a week in Bury St Edmund with Vic’s folks. We arranged to share a house with Vic’s mate, Lisa, who lives in West Ham, East London. So we’ve been here for two and a half weeks, and Vic started a temp job last week. I’m starting a 3 month contract on Monday working in one of the data centres at East India Dock. I’ve got a DSL connection in the house through the “UK Free Software Network who are an Entanet reseller. They do a monthly contract with a generous download limit so that suits me fine. I’ve set up my old Linux server with a new copy of Ubuntu Linux and a cheapy wireless card. That’ll be going somewhere out of the way shortly as it’s a bit noisy for the hallway. Can’t say that we’ve been overly delighted to be back in the UK. The weather has been grim, London seems to have become even grumpier than it was when we left and everything seems so expensive. We’ll see how things go with work and decide what we’re doing next after we’ve been here a while.